Our Professional Services give organisations independent, professional IT advice and recommendations covering every stage of the IT lifecycle, from planning and designing, to deploying and operating. We use a wide range of technologies and vendors to design and deliver strategies, architectures and solutions that are tailored to individual needs and never pre-determined. Every client is unique which is why we provide organisations with the most talented, experienced and committed IT professionals in the business. We work closely with organisations to explore new infrastructures, operating models and an increasing array of cloud services to improve business outcomes and costs. Everything we do is benefit driven and designed to help organisations become more flexible, more reliable and more efficient. With AMS, business departments can rapidly implement technology IT solutions without incurring internal IT time and costs to provide the underlying infrastructure and support services for project delivery (DEV, TEST & PROD environments) and ongoing application maintenance and enhancements. AMS is offered for annual or multi-year agreements and consists of three services: Level 2 Helpdesk - rapid response technical support for system administrators to answer customer-specific configuration/customization questions. Enterprise Data Warehouses, business application software's and BI reports are constantly evolving, requiring ongoing care and feeding to cost-effectively meet the changing and evolving analytical needs of the business. The result is a constant stream of user requests to modify or enhance (add to) the data warehouse ad hoc analysis, reports and dashboards. 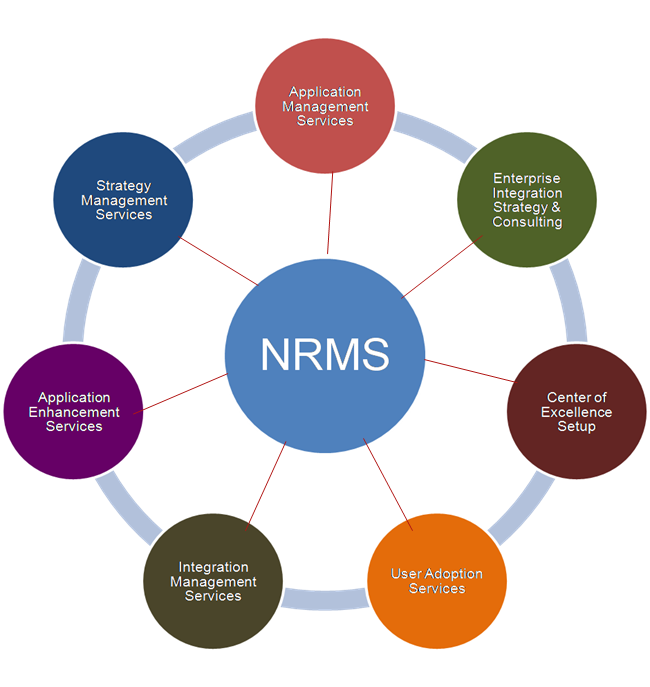 NRMS's Application Enhancement Services (AES) offers clients a cost effective approach to support end user enhancements requests. To avoid drowning in a sea of often conflicting metrics across an organization, NRMS offers a set of Strategy Management Services (SMS) to translate business priorities into operational BI analytics. SMS, often used in conjunction with the performance Scorecard and Strategy Management product, helps align an organization around corporate priorities: Key performance indicators which best measure and communicate the status of corporate strategic and operational priorities and objectives. Streamline projects to focus on the KPIs or metrics most critical to business priorities. Data governance is critical to successfully developing and sustaining BI investments. Bad data can lead to bad decisions. NRMS has developed Information Management Services (IMS) to assist clients in establishing data governance processes, tools, competency centers, data stewardship roles & responsibilities, and training, to maintain the data hygiene critical to BI application success.